This series of images illustrates how real estate practices combined with other discriminatory policies to facilitate DC's racial transformation in the 1950s and ‘60s. 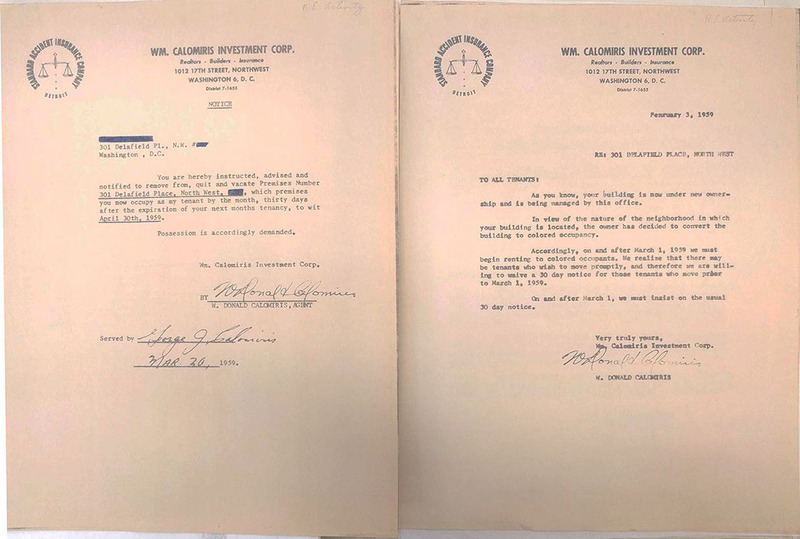 Most are documents from the records of Neighbors, Inc., which advocated for a legal ban on racist real estate and banking practices. 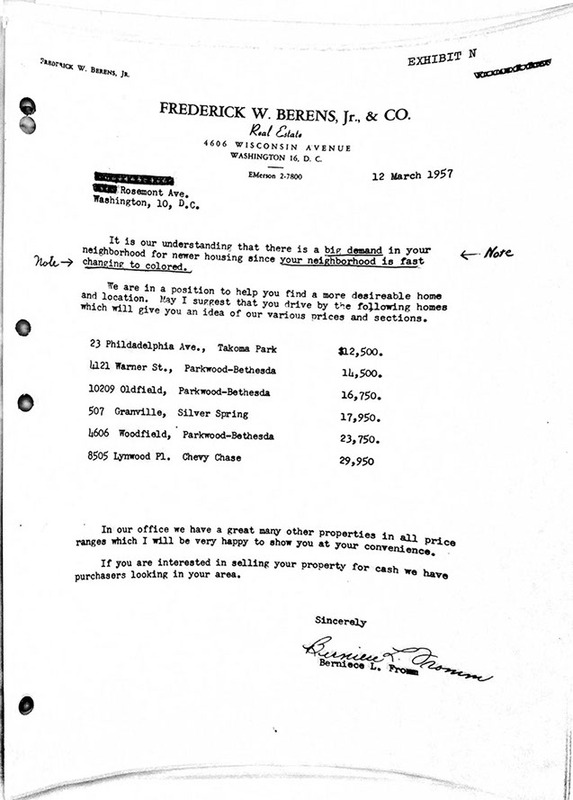 The group compiled them for submission to the U.S. Commission on Civil Rights for the 1962 report, "Civil Rights U.S.A./Housing in Washington, D.C."
The documents speak to the outsized role of Realtors and the federal government in promoting white outmigration to the suburbs and black settlement in DC neighborhoods east of Rock Creek Park. Blatantly racist tactics and policies scared white homeowners into believing that the arrival of African Americans would reduce property values. Landlords used race as a basis for evicting white tenants, and charged higher rents to new black residents. 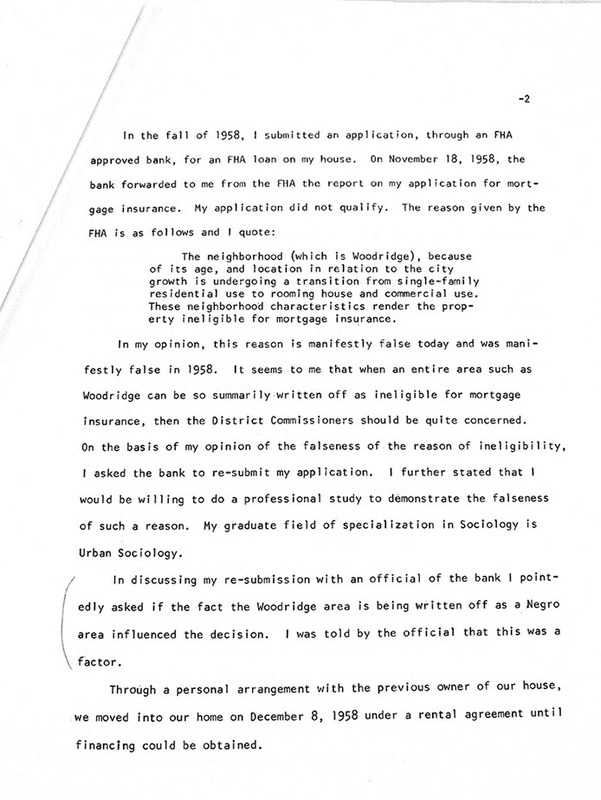 Neighbors, Inc.’s dogged documentation of the race-based strategies used to stimulate the real estate market and resegregate the city, along with the work of other advocates, eventually led to a local fair housing law. 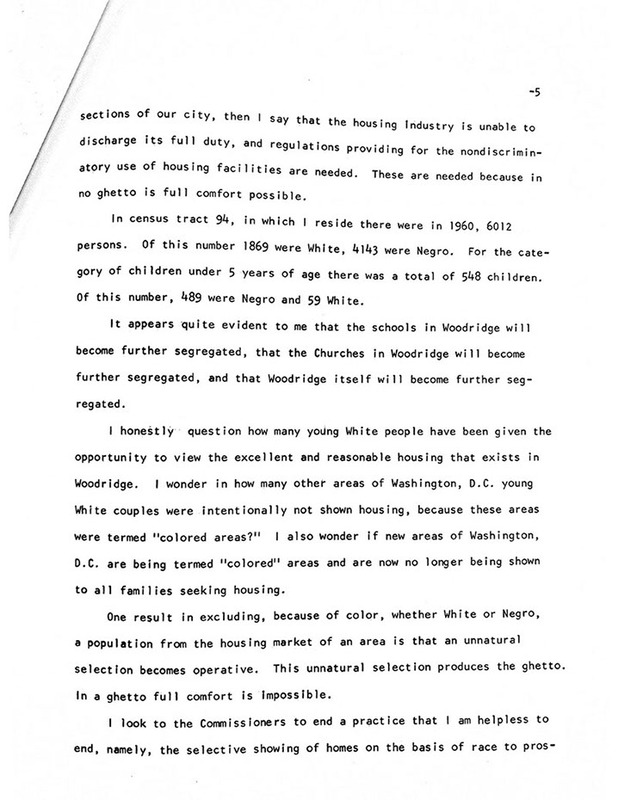 DC’s ban on racial discrimination in the sale or rental of housing, which took effect in January 1964, set the stage for the federal Fair Housing Act of 1968. 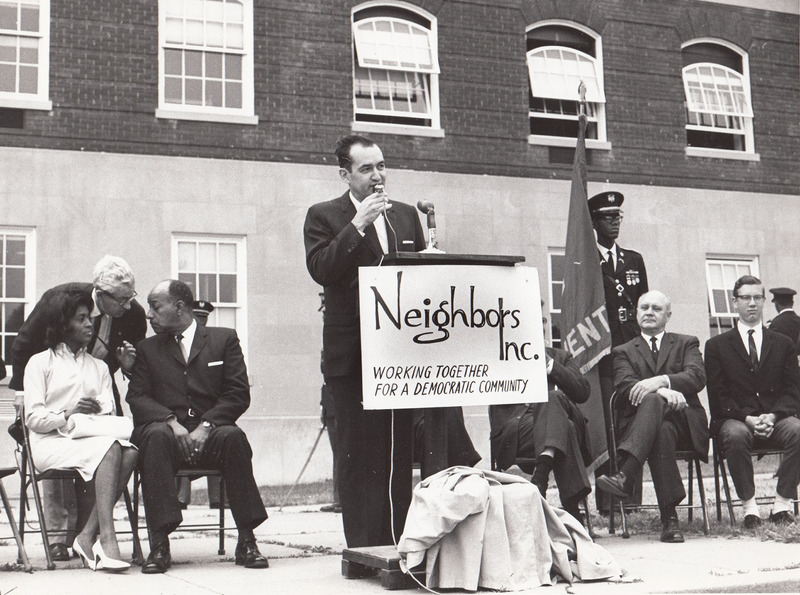 Neighbors, Inc. was established by an interracial group of Manor Park residents in 1958, when their neighborhood citizens association refused to admit black members. 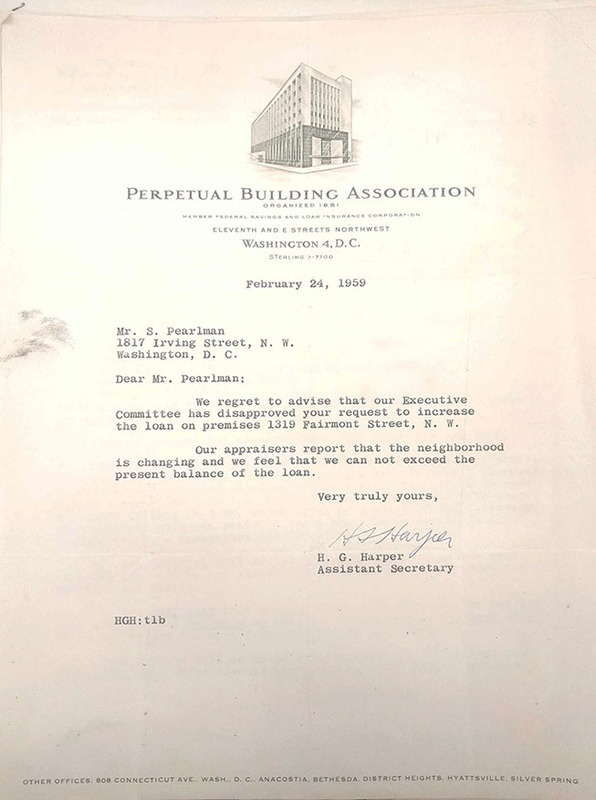 Neighbors’ founders included Marvin Caplan, who later became a senior lobbyist for the AFL-CIO and directed the National Leadership Conference on Civil Rights. Margery Ware, formerly a housing specialist for the National Urban League’s Washington bureau, was the organization’s longtime director. With the goal of building a stable, integrated, urban community in the face of real estate practices and public policies that promoted segregation and white flight, Neighbors, Inc. initially defined its boundaries as the blocks surrounding four schools south of Missouri Avenue and extending north to the District line. 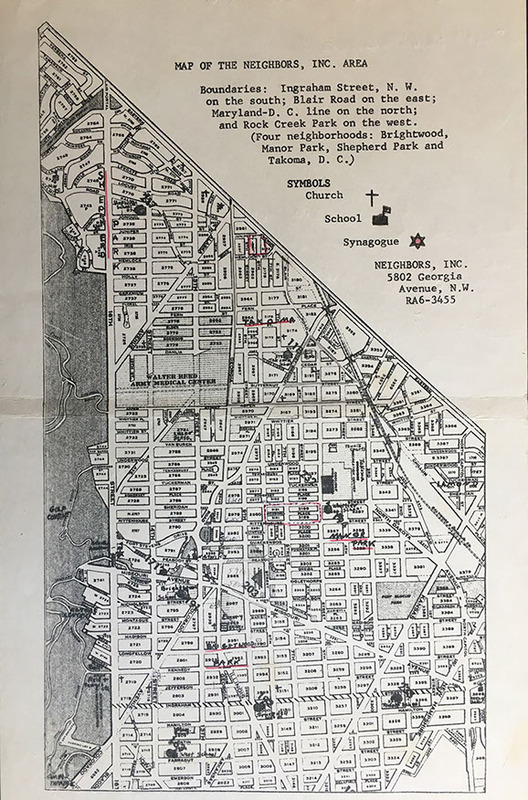 Neighbors, Inc. advised white families on resisting pressure by real estate agents to move out of the city, ultimately focusing its efforts on Shepherd Park. The group was less successful in stemming white flight from other neighborhoods or from Ward 4’s public schools. A Mount Pleasant resident provided this letter as evidence of racialized tactics for encouraging white migration to the suburbs. In many cases, the same real estate brokers profited from home sales in DC and new home purchases in Maryland or Virginia. 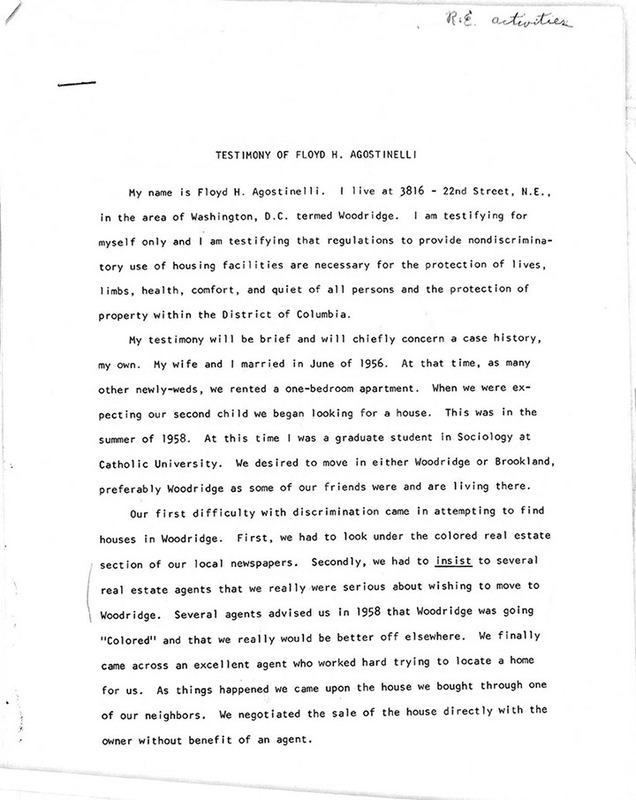 Neighbors, Inc. collected materials such as this notice as evidence of landlords' role in facilitating racial turnover and resegregation in DC's Petworth neighborhood. The American Veterans Committee worked to eliminate racial language in newspaper housing ads. DC's daily papers quietly adopted this policy in 1960. Banks redlined neighborhoods such as Columbia Heights, in keeping with the Federal Housing Administration's classification, starting in the 1930s, of racially changing and African American neighborhoods as bad risks for home loans. 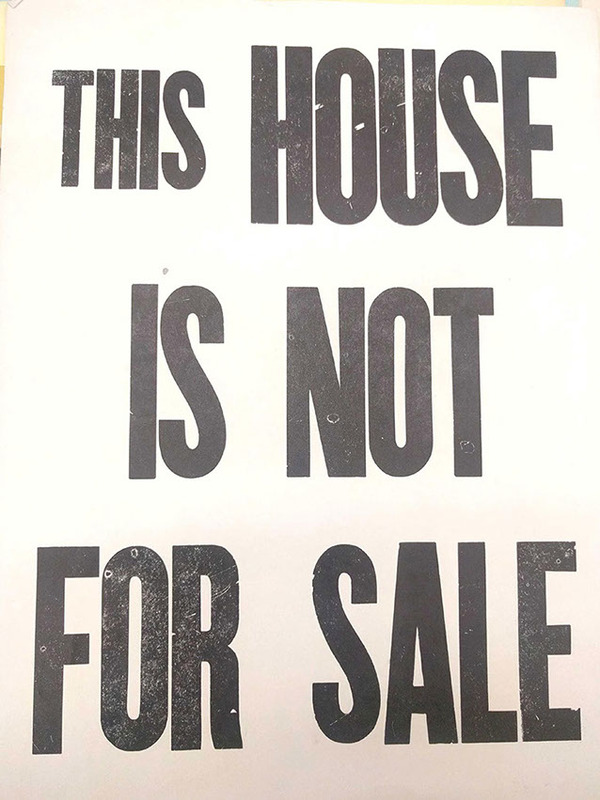 In response to advocacy by Neighbors, Inc. and others, DC banned the display of "Sold" signs in 1959. 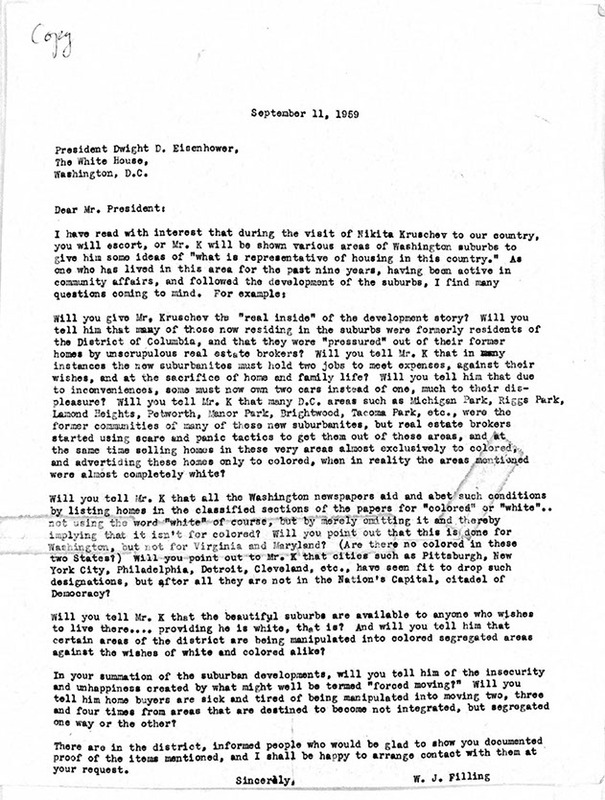 This letter to President Eisenhower details the role of real estate officials and local newspapers in facilitating DC's racial turnover. 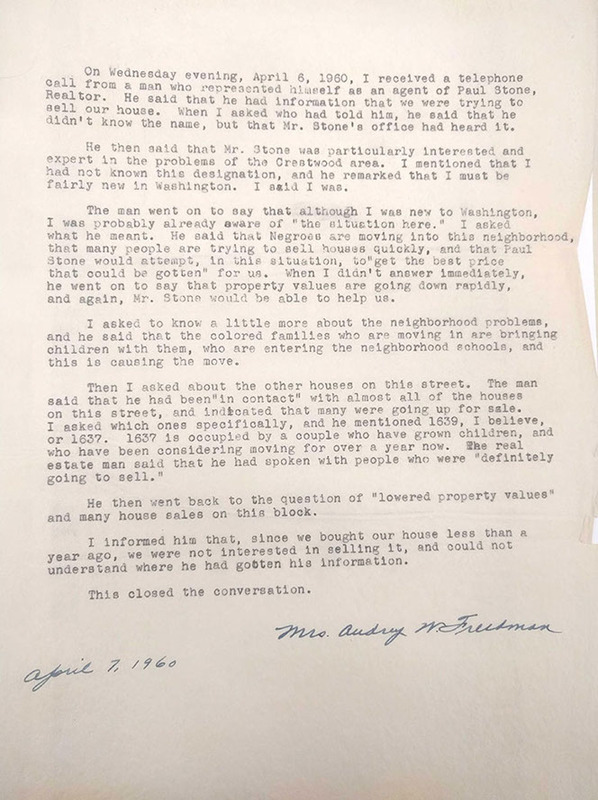 Exhibits submitted by Neighbors, Inc. to the U.S. Commission on Civil Rights in May 1962 included this memo from a Crestwood resident about a call she had received from a Realtor hoping to sell her house. 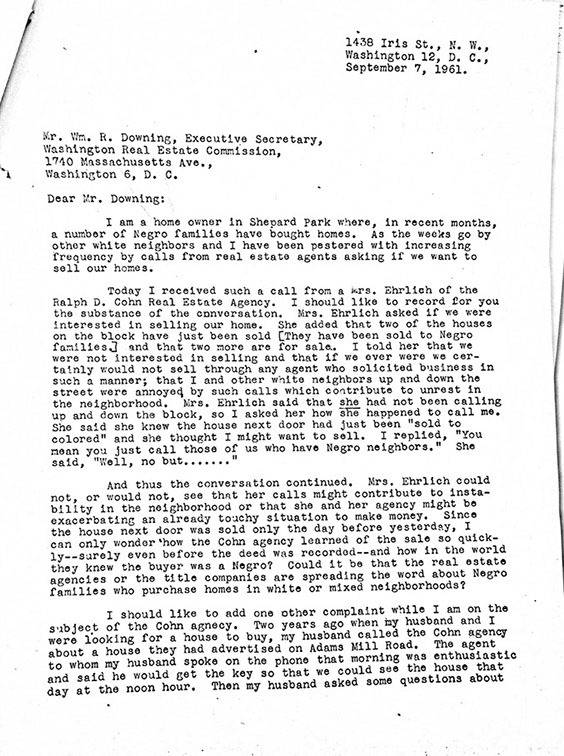 A white Shepherd Park resident's letter to the Washington Real Estate Commission describes an inquiry she received from a real estate agent just after a black family moved in next door. She also mentions her husband's earlier effort to visit a house in Adams Morgan that the same agency had advertised but refused to show to a white client. 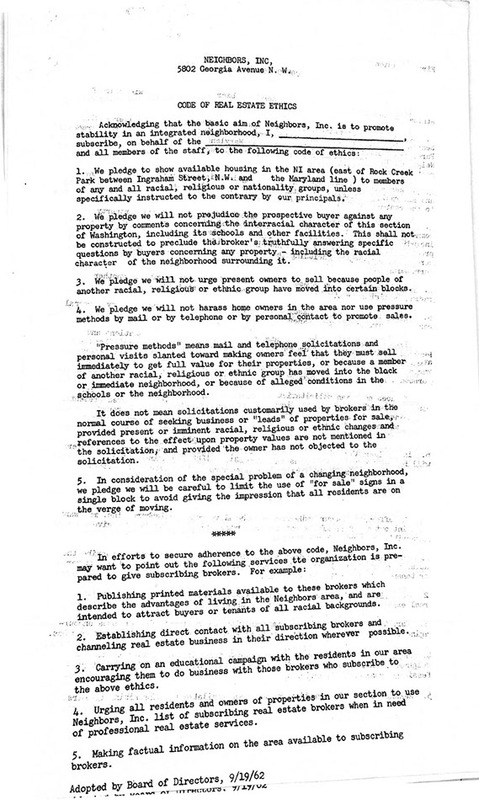 Neighbors, Inc. drafted a real estate ethics code that committed signers to avoid racial steering, harassment of homeowners, and "pressure methods" to promote home sales. 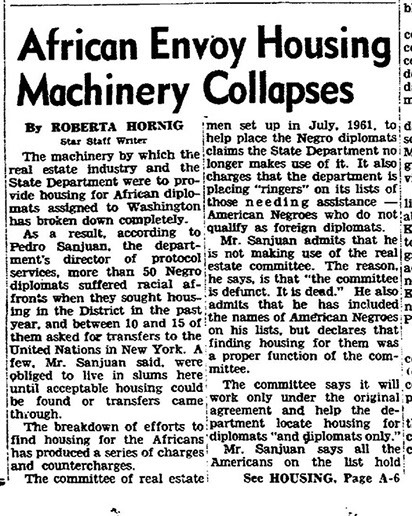 Local real estate officials broke a commitment to make housing available for African diplomats after discovering that the State Department had included some "American Negroes" on a list of people who needed housing. 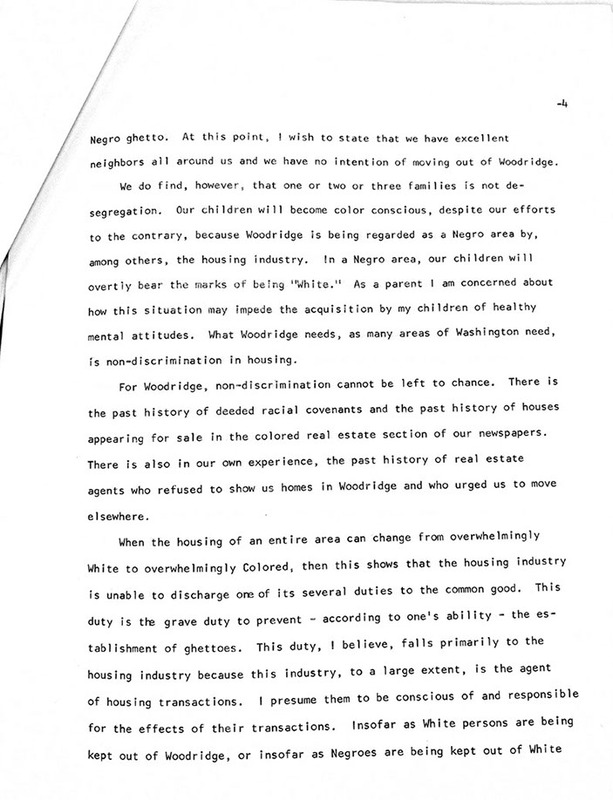 A resident of Woodridge in Northeast DC presented this testimony supporting a local fair housing law. 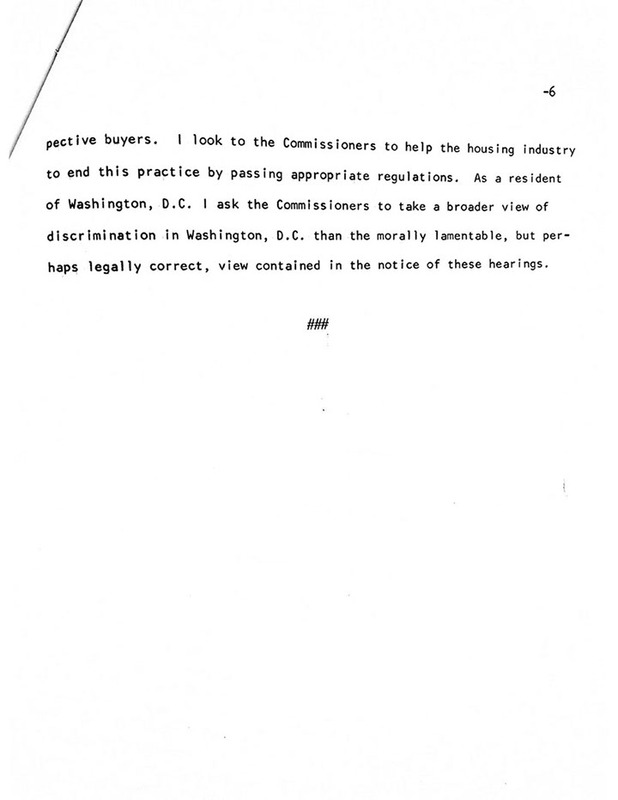 In December 1963, the DC Commissioners adopted a regulation banning racial discrimination in the sale or rental of housing, long after cities such as New York and Pittsburgh had taken similar action. 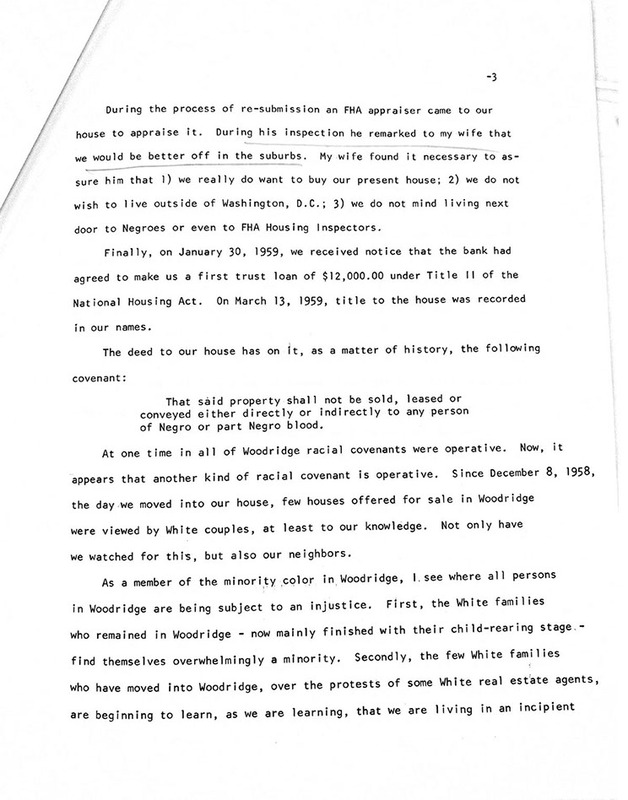 A local fair housing group whose mission was to help black families move to the historically white Chevy Chase neighborhood west of Rock Creek Park "is having trouble finding Negroes who want to move in," the Evening Star reported in June 1964. 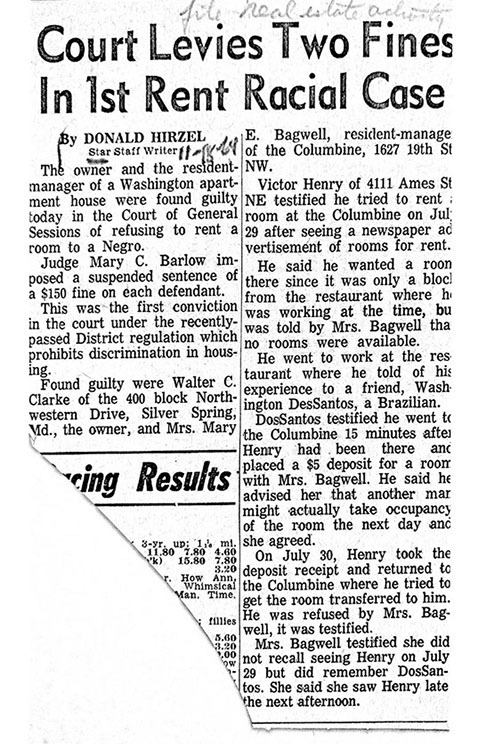 On November 18, 1964, the Evening Star reported on the first conviction of a landlord for racial discrimination under DC's fair housing regulation. 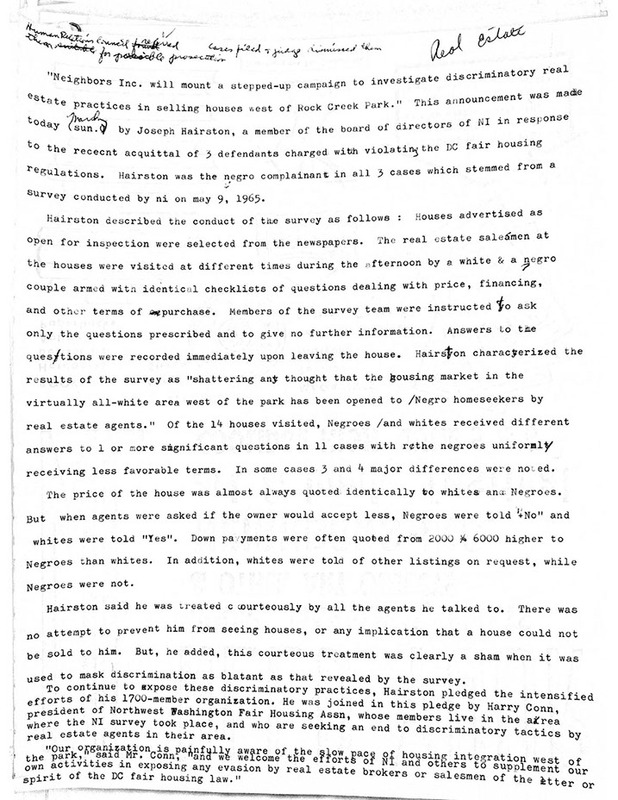 Neighbors, Inc. drafted this report on a May 1965 survey conducted west of Rock Creek Park by white and black couples posing as potential homebuyers. Realtors continued to use racially discriminatory tactics favoring whites by quoting African Americans higher down payments and inflexible pricing terms. This sign was produced for white homeowners to ward off real estate solicitations and assert their intention to stay put. 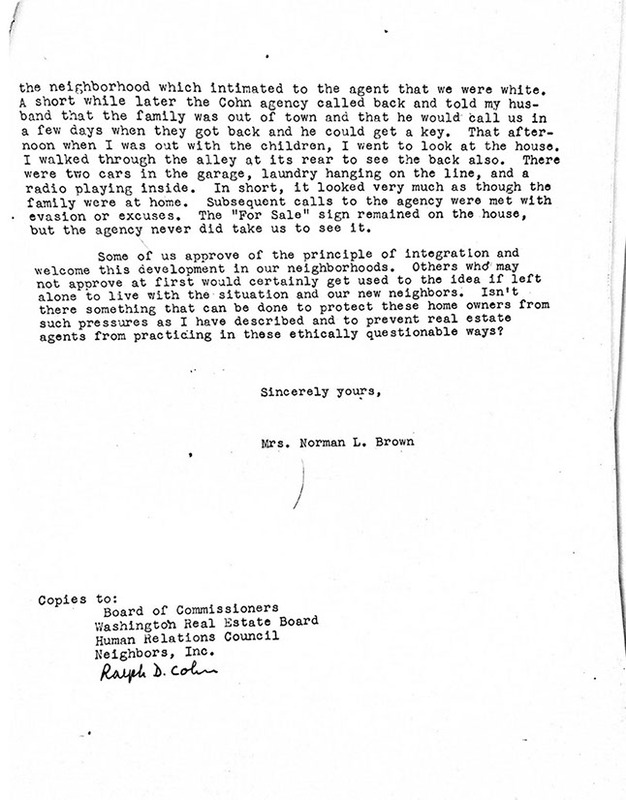 DC's fair housing law took effect on January 20, 1964, and the first complaint was filed five days later. By November 1964, the number of complaints filed in DC (110) was second only to the number filed in New York.